Summer’s gluts of courgettes (zucchini), tomatoes, and herbs deserve a new way to cook, and we’re not talking about messy barbecues here! Instead of a smoky bombshell why not try out a light and delicious bread pudding with a spoonful of tomato, olive and onion salad on the side? Soup is generally the last item I feel like eating, but I do like making it. Often inspired by flavoursome veggies, I stick to small amounts – no more than 1.5L – and feed them to Himself who loves soup. Chicken Sausages… Good idea or off beak? The leading trend for many farmers in the UK is to become involved in the creation of their own products as well as just the raw materials. This no doubt has financial and business sense behind it as I’m sure many of them would rather just farm. Selling their own meat boxes, vegetable boxes, dealing with online customers and email isn’t always compatible with walking out amongst sheep. Many like to think of themselves as businessmen above all else, and some of them certainly are. A certain local poultry farmer, David Knipe seems to have a bit of the touch. Chicken and turkey burgers are a ‘been there, done that’ type of thing, but how often do you eat free range chicken sausages? This is what I imagine a ‘cassoulet’ to be like. I’m not sure that I’ve ever had one on purpose. Chop into large bitesize pieces whatever helpless, aging vegetables you have hanging around. I found peppers, onions, tomatoes, garlic and celery hanging around, so in they went (garlic with the skins still on). Give them a spin in a bowl with a sprinkling of salt, pepper, and a couple of teaspoons of olive oil and place on the bottom of a baking dish. 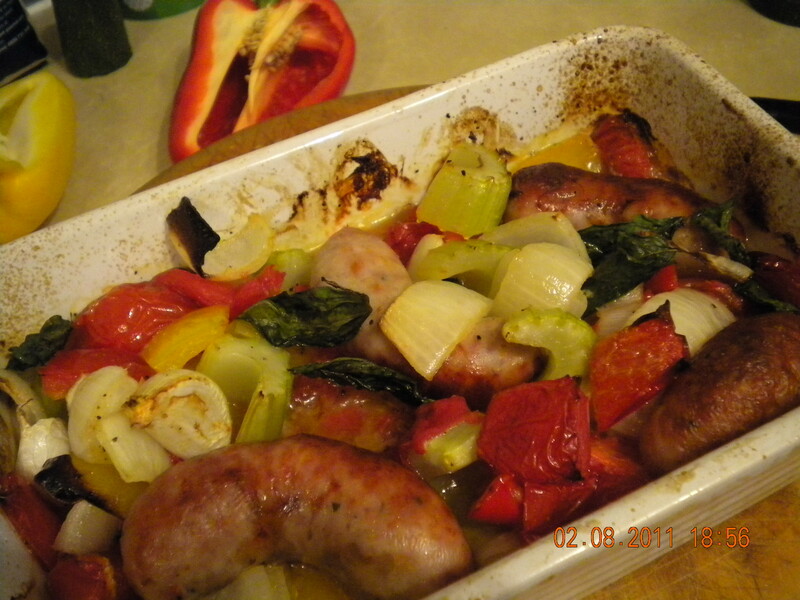 Snuggle the sausages into the vegetables and put into the oven on 180 deg C for about 25-35 minutes. 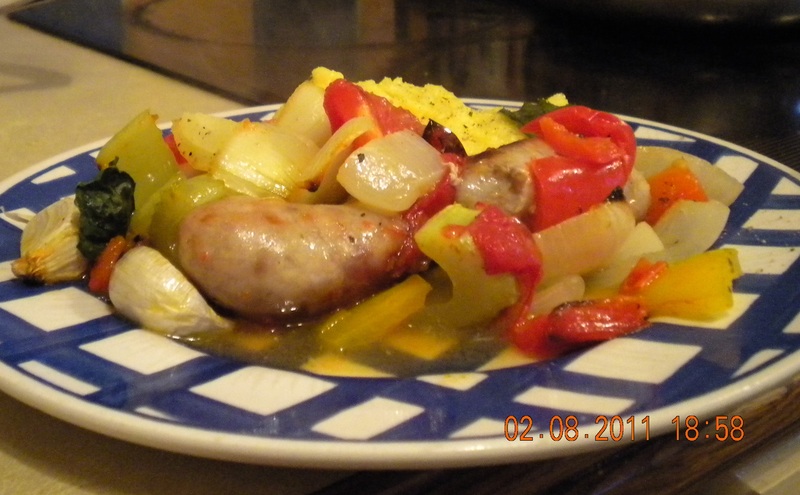 Remove from oven and eat… with mash, or bulghar wheat or as in my case, cheesy soft polenta. 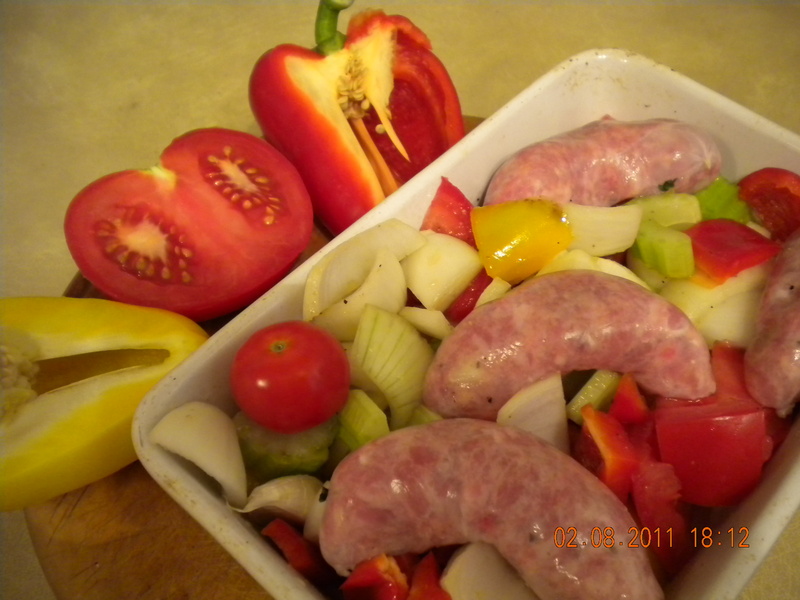 The tomatoes make the dish moist and the meat juices trickle into the medley below. And the sausages? They were surprisingly like pork sausages. I would guess they were flavoured with a pork sausage mix. There was an overcurrent of sage but it wasn’t too strong and they were extremely meaty. If you have been used to the pap which is more breadcrumb fillers and eyeballs than meat, these sausages would blow your socks off. They were a great deal more substantial than anything I have had for some time.